Arth – Samvaad 2014 concludes amidst piquant discussions, applauds and cheers! 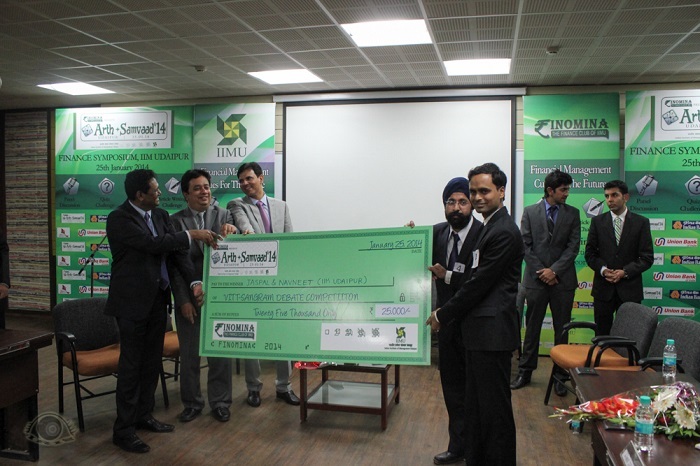 Finomina – The Finance Club of IIM Udaipur successfully organized Arth – Samvaad 2014, the second edition of its annual Finance Symposium on 25th January, 2014. The clubs and committees of IIMU give ample opportunities to its students to master the tapestry of learning and holistic development while getting hands on experience in organizing events. Finomina’s constant endeavor remains imparting to the students of IIMU, the latest knowledge from the world of finance. In light of the recent economic complexities and the challenges faced by corporates in financial management, a host of speakers, all leaders in multiple financial services organizations were invited for the symposium. The event flagged off with an opening speech from Prof. Janat Shah – Director, IIMU who presented his vision for the institute with strong emphasis on research, analysis and entrepreneurship. The umbrella theme for Arth-Samvaad 2014 was Financial Management – Cues for the Future, aptly developed around global financial chaos and prominent future opportunities in the sector. The Chief Guest of the event, Mr. V S Sundaresan, Chief General Manager, SEBI efficiently deliberated on the topic progressing through the performance of financial markets in leaps and bounds and how SEBI’s focus has been around Products, Processes and Participants. Prof. Janat Shah has always been a driving force motivating his students. And IIMU students witnessed a sheer moment of this construct when the Chief Guest was joined by the Keynote Speaker of the event, Mr. Satya Narayanan R, Founder–Chairman, Career Launcher. Mr. Satya Narayanan R has been a student of Prof. Janat Shah at IIM Bangalore and his entrepreneurial success in leading Career Launcher to the helm among the Educational Services companies of India shows the prominence with which Prof. Janat Shah champions the transformation of his students exalting all of them with his vision. Mr. Satya Narayanan R discussed about the role capital markets can play in influencing the masses and the values like paying back to the society which should lead the businesses. The event saw two important panel discussions between eminent corporate leaders. The first panel discussion with the sub-theme, “Corporate Finance – Does Practice Meet Theory?” had panelists Mr. V Srinivasa Rangan, Executive Director, HDFC, Mr. Sourav Mallik, Senior Executive Director and Head – Mergers & Acquisitions, Kotak Investment Banking and Mr. Srinivas Baratam, MD, Kriscore Financial Advisors. The discussion was moderated by PGP student, Dhiraj Kumar. The vast experience of these professionals nurtured an engaging and enriching the discussion with various aspects of corporate finance touched upon like conservatism, valuation to the shareholders, gaps between theory and the dynamic world of practice, debt, equity and the challenges of expected returns in the market. The finance enthusiasts of IIMU were equally excited to be in the audience and the panelists instantly struck a chord to inspire the students as role models with their innovative talks, delivering complex financial jargons in a light manner keeping everyone in splits. The precursors of the final day event were competitions under the title Vitt-Sangram, the Pan India Debate Challenge, Quiz Competition and Article Writing Contest. The participants from leading B-School joined the team from IIM Udaipur for battling their knowledge out in the arena in front of the judges. The second panel discussion revolved around the sub-theme, “Capital Markets in India: Infancy, Early Adulthood or Mature?” with the panelists Mr. Sandip Sabharwal, Investment Advisor and a Star Fund Manager, Mr. Amit Thawani, Executive Director, Nomura Financial Advisory & Securities (India) and Mr. Imtaiyazur Rahman, Group President & CFO, UTI AMC with the discussion being moderated by PGP student, Naimish Shah. The speakers discussed about the market size of Indian Capital Markets, Mutual Funds, IPO and the effect of GAAR on the Capital Markets. Finomina’s stride to deepen the financial acumen of the students of IIMU culminated on a promissory note with the launch of the 4th edition of Arthaarth, the Quarterly Magazine of Finomina. The speakers insistence on getting the foundation and clarity of concepts in theory right before practise left the students motivated. And the institute’s infrastructure with sophisticated Bloomberg Terminals leaves no stone unturned in shaping the best finance leaders of tomorrow. The event concluded with a vote of thanks and prize distribution to the winning teams from IIM Udaipur and SIBM Pune of the Debate Challenge, as well as a token of gratitude expressed for the event sponsors, Union Bank of India and Indian Bank. The other participating teams were IIFT Kolkata and IMT Hyderabad. The winners of Article Challenge were IIM Bangalore and IIM Udaipur. And the Quiz Competition was won by IMT Ghaziabad, NMIMS and IIM Udaipur.